Ultraman Holy Grail Find ! I won’t even go into how most people know me, and that’s as a Ultraman collector 😉 In fact, before all this toy stuff I do I was an Ultraman collector .. my web site www.ultramantoys.com , in fact, was an early way for me to interact with fellow collectors and fans .. now all my time is taken up with my toy company, Max Toy Co. … so much so that I actually do not buy as many Ultraman toys as I once did. Well to be honest the newer stuff after say Gaia never really spoke to me… at least not on a collecting level. Also, I’ve reached a point in my vintage collecting that the few items that i do not have are one, way too expensive or two, something i just don’t know about. Case in point .. this toy i just got. So about 2 years ago, while searching Yahoo Japan, I stumbled across some amazing original art auctions .. in hindsight I wish i went all the way on some of the items that were up for bid .. but, alas watching my collecting budget, I focused my attention on a few wonderful pieces.. and got them ! 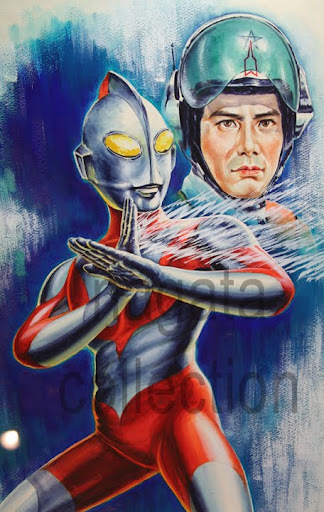 One them being this gouache on board illustration of Ultraman, with his alter ego, Hyata behind him. I do not know the artist ( if you know please email me the name ! ) it is done in vibrant colors and is quite large in size, 11 x 23 inches. So until a few weeks ago, I’ve been searching to find out what this art was used for .. the other pieces I won, I was able to match them up with boxed ray gun type of playsets, but this particular image i could not find in any books I have. and suddenly while searching Yahoo Japan, Bingo !!! 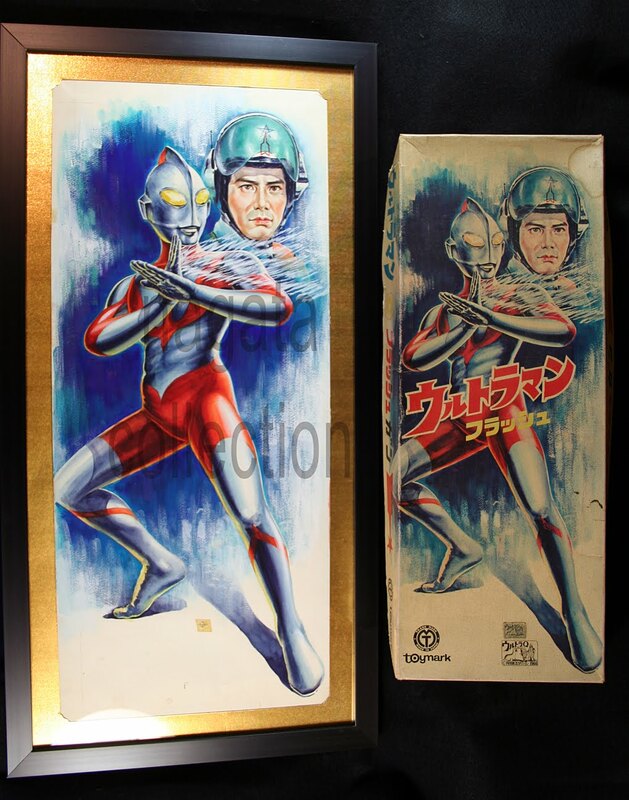 I find this auction, for an Ultraman gun set by Toymark .. and look whats on the front cover .. yep .. the same painting ! So, needless to say I was not going to lose this auction .. having never seen this set before and owning the original art for the cover .. I knew it to be my Holy Grail ! the playset is fairly straight forward and actually kinda boring… the gun is obviously re-used from a military type of gun .. not even a ray gun type. The gun does not fire anything, but sparks and makes a grinding type of noise when the trigger is pulled. But, even though the actual toy is not too exciting, Boy the front cover does it for me ! Over all while comparing the art to the cover they are about actual size .. the time period for this gun would be 1966. While the box has some water stains, and is a bit faded, it is still a very nice example .. and as i said something I have not come across in my 20+ years of collecting. So just when your not looking, something will fall into your lap ! Toy Karma at work .. now the original art and the toy can rest easy having been reunited in my collection ! Now that’s a Love Story I like to hear !! !